On a sad, sad day (the end of the Edinburgh International Bookfestival), Blythe and I met up for a meal prior to going to the last Unbound event put on by the Scottish Book Trust. We opted for Caciopepe, which is located on Hanover Street in that cluster of restaurants between George Street and Queen Street. The restaurant was pretty empty as we arrived 30 minutes shy of international dining time (7:30) and I took a seat near the door and perused the menu as I waited on Blythe. Their menu is large and comprehensive, but not overly so. 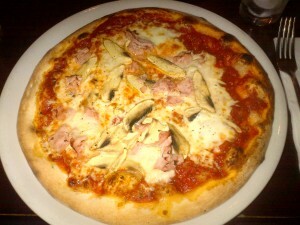 They serve a variety of pizzas, grilled dishes, which looked delicious as they came out of the kitchen, and pastas. When Blythe arrived right on time, I was ready to order. I went for the classic spaghetti alla putanesca and figured that the pasta would be more than enough for me, I forwent any starter but matched my tomato based pasta dish with a rich Chianti wine. Soon Blythe’s soup arrived, looking rich and robust with the flavour of the pork and the beans melding nicely with the undertones of garlic (I tasted a bit). It looked hearty enough to be a meal in an of itself. Soon after, our mains arrived. Blythe’s pizza and my putanesca. The large serving of pasta was well-cooked with just enough bite to the spaghetti, while the tart, saltiness of the olives contrasted nicely with the sweet, slightly acidic taste of the capers and fresh tomatoes. The anchovies gave a deeper note to the dish, but when I got a bit of one whole, it was overpowering and they might be better to break the anchovies down a bit more. It was a large, robust dish, well-seasoned, and perfect for the events of the evening that were to follow. And, since the pricing was pretty spot on, I’d pop along again should I be in the area and craving Italian cuisine. The final night of the Book Festival was upon us, so one final visit to Charlotte Square gardens beckoned. To fortify ourselves for an evening of reverie, the suggestion was that some simple fare from one of Hanover Street’s many reasonably priced Italian’s might be the way forward. Accordingly, we headed to Caciopepe, which to the uninitiated is the place that was the Patio for many years. Upon arrival, I found MJ safely ensconced in the front part of the restaurant, so joined her, once I’d removed my sporty rainwear. Service was attentive, but we had quite a range of options to consider, so we took a moment or two to contemplate. MJ was pretty settled that pasta was the way forward, while I thought I’d try a pizza, to follow my soup. On a recommendation I opted for the pasta e fagioli, over the minestrone, then opted for a ham and mushroom pizza. 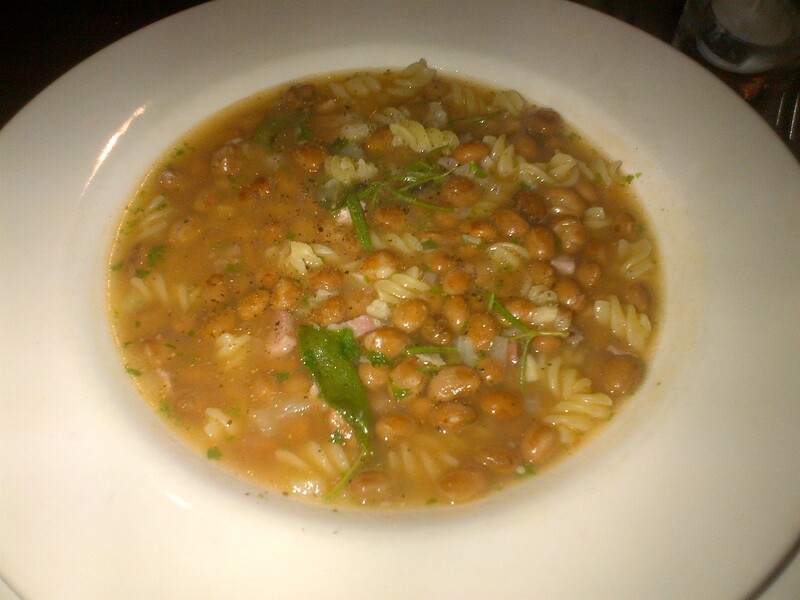 My soup arrived promptly and looked stacked with both beans and fusili. Served in a light broth, and featuring nice porky chunks, this was a good opener. I’d happily order it again. When mains arrived, MJ’s pasta looked fresh and plentiful. My pizza looked much as you would expect: a delicious cheese pizza, all for me. It was tasty stuff, in a fairly regulation way. I had a hankering for pizza, and this met the need very nicely. It was not write-home-tastic, but it was entirely suitable for my purposes. So overall, Caciopepe served us pretty well. It didn’t set my pulse racing, but it very neatly met our requirements. I think it can safely relied upon to provide a good standard of Italian fare that’s likely to please.